I have a few blogs to write today covering a few different topics, so be sure to check each of them out. For this particular post, I am going to just show my charts and you can draw your own conclusions, so it will be a short post. I do plan two more posts today, one will be a bar-by-bar evaluation of how to decide when to trade or not trade. 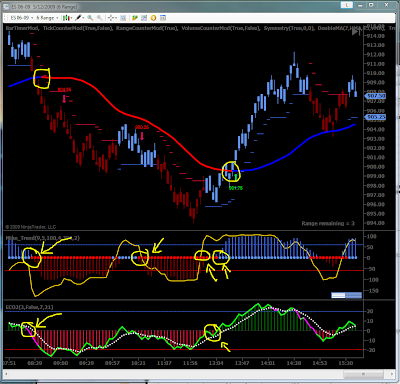 The second will be more information on my Symmetry indicator, my audio alert files, and more about my Scoring system (all as requested by readers). Reminder - I am in Dallas, all times are Central (one hour behind NY time). I will discuss rules of Symmetry in another post later today. Symmetry called a short @ 908.50 at 8:40am. I like to use a 5 point target, which would have been met. If you had a runner using stop/reversal marker, was good until 12:45pm when you exited @ 898.75. Symmetry then called a long @ 899.50 at 1:20pm (the one at 902.50 is ignored, as I am already in a trade in same direction). 5 point target easily met, and if you used stop reversal marker for a runner, your exit was 3:00pm @ 904.25. This is an example of having a realistic hard target (5 points) can come in handy, as the reversal system often gives too much back. Symmetry called a short @ 904.25 at 9:04am. 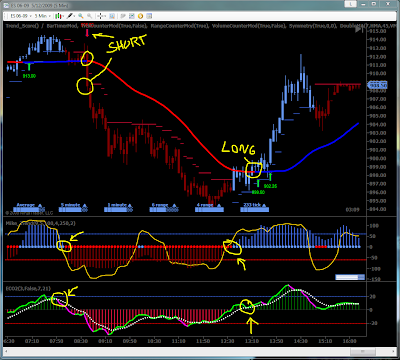 I will review my system on this trade, I believe it was supposed to call it a few bars earlier as soon as the DoubleMA 45 started falling. The trade would have tapped a 5 point hard target and may or may not have been filled, before it reversed and took out the stop reversal marker at 903.75 at 10:06am. The second trade on the 6r Symmetry called @ 901.75 at 1:41pm. This long was good for an easy 5 points. If you used the reversal system, it came back at 2:45pm and your exit would have been 907.00 for the runner. Stay tuned for another couple posts tonight describing in more detail my setups. Today's trading was a great joy compared to Monday's trading. I am using your ECO along with some other indicators. Yes Monday was terrible. The key is to be able to have a system in place to help you realize this as early as possible, and then simply do not trade. The stock market will be there tomorrow, and your first goal everyday is to not LOSE money, and not worry about not MAKING it. I'm glad you are enjoying the posts, I hope they are helping your trading.